HAPPY GIVING BACK TO YOURSELF. Thank you for your positive words ! Bahut khub surati se likha h. Bandhan chahe sone ka pinjra ho, chandi ki bediyan ho kastdayak hi hota h. Kuch pal ya kuch cheejo ke liye lalach karke ya alas karke hum nirnye lene me peeche hat jate h. chidiya ko bad me ahsas hua aur wo azad hui. Bahut khub likha h shubhkamnaye. Shukriya, kavita ko pasand karne aur shubkamnao ke liye ! Thank you ! That’s very kind of you to say. Noble thoughts don’t just collide to anyone on the shores of mind, despite that the cerebral capacities may be par excellent or even if person may be ranked at pinnacle order of intelligence. If one such brainwave can hit you to smolder the paper under pent up pen, I then stand enthralled over…..what all you can ponder and reduce it into beautiful verses. It really seems challenging for me thereafter to read your mind and consequently harmonizing my mind to flow along with that what has been inundating and deluging my mind incessantly. Your prowess to write cantos is even more worthy of appreciation than what I may lionize. This time it has been a little bird chirruping its thoughtful intent to you. I think your mind was reverberating with that little birdie. 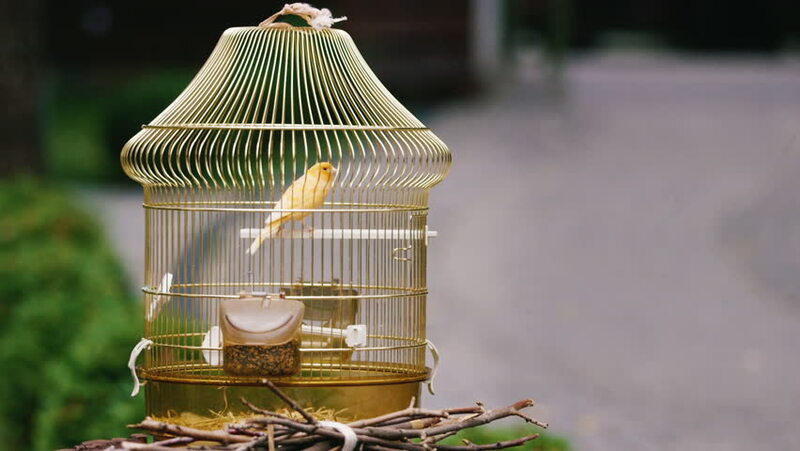 The poem goes pretty well over the Catch-22 situation in which the bird is trapped & has its own introspection and wages her war to resolve for possibilities….because she is into her own conflict with her mind with regards to misgivings over her freedom out or the dependency which has been availed all through the subsistence enjoyed till date. It’s not like renunciation of the available truth, but it’s like discovering the real truth beyond the horizon which may be another pursuit full of struggle…. (because maybe the cage owner must have deliberately left open the cage, maybe he was honest in providing her the best of sustenance……yet the little birdie might have an illusory concept of world beyond cage, maybe the bird might have been totally aware of the real world beyond its incarceration and would be prioritizing between the ethos of obligation/comforts and innate desire & characteristics to fly high in the sky) Yes, nothing is free…..one has to give up for the choices then……the poem then ascends atop the high skies…..flies, glides and makes us feel liberated effortlessly……..yes she could fight her abilities and disabilities. “Just living is not enough…one must have sunshine, freedom, and a little flower.-Hans Christian Andersen”…this goes with the opening verse of this beautiful poem. This makes us to contemplate over the choices and innate yearnings. Seldom we indulge into listening to ourselves…..but the caged soul could cogitate over its present prominence and looming possibilities. It seems that she could weigh her choices pragmatically, since she was forcing herself to taste freedom & relinquish her painful comfort zone in captivity. It can be related with the feelings with most of us, wherein we may desire for a better prospect despite that we may be into the most sought and envied position. Therefore the hunt for satisfaction is that little flower which Hans Christian Andersen propounds & George Orwell contradicts. Sustaining in shackles(unilateral obligations) with comforts is mostly perceived as affluence & attainment, which is the deemed convention of success. “Conformity is the jailer of freedom and the enemy of growth”.-J F Kennedy has not erred in saying so. Freedom has its own copious measurements for any aspects. It is inexplicable…..one has to attain it….worldly luxuries wont mesmerize you forever….there has to be a momentary pause…..and it’s that moment which enlightens & fortifies the impeccable paradigm of freedom. But then you need to peep out for fluttering the wings. “The secret to happiness is freedom….and the secret to freedom is courage.-Thucydides”. Yes to renounce common privileges one needs this courage. Love for chasing our innate desires ensures freedom, because we can’t love in state of captivity. Love defines freedom…..Rabindranath Tagore has said that, “love does not claim possession, but gives freedom”. Significantly a cage need not be any physical captivity….it could be the monotony, stringent control, monitored surveillance….. A beautiful song goes like this:- tu pyar ka sagar hae teri ek bund k…you are an ocean of love, there is a desire to quench this thirst by merely one drop…. HYPERLINK “https://youtu.be/e2D-kjOMNF0” https://youtu.be/e2D-kjOMNF0 relates for the flight of freedom of a soul who is fluttering in her captivity……..listen to it spellbound……every word has been aptly chiseled…..yes making choice & choosing the right one is the most crucial task. Third & fourth verses are complimentary to each other and it’s very obvious for the infirmed & impediment lot to exercise the flight of freedom. It may take maturity, ageing, education, experience, failures, honing of skills, support of parents/associates/mentors/gurus/soul-mate…(A friend is someone who gives you total freedom to be yourself.-Jim Morrison may be true for few lucky ones)……& along with it lot of introspections, grudges, regret sessions are needed to enlighten the road map for perfect freedom…..but then it finally ensures an effortless flight to soar to zenith, the real realm in which one is destined to find its attainments freely. The concluding cantos has the punch line enshrined with the wisdom to fly for freedom…..unshackling ourselves to rediscover ourselves. Yes that has to be ecstatic & euphoric for any one as this flight is the perfect one….without impediments……& only attainments of liberation……assuring & ensuring eternal happiness/peace. Abraham Lincoln was right to quote that, “America will never be destroyed from outside. If we falter and lose our freedoms, it will be because we destroyed ourselves”…..on same ratio we must endeavor to have courage enough to protect ourselves. Lastly, “Nobody can give you freedom. Nobody can give you equality or justice or anything. If you are a man, you take it.-Malcolm X”. Thus the parlance of freedom has abundant dimensions…. CHOICE IS OURS…..WHETHER TO FLY HIGH OR BE SUBSERVIENT TO COMFORTS OF SLAVERY……ultimately death will defeat us some or other day and that can be won only if we lived free. Marking my end……with a song…chul ud jaa re punchhee…o bird please take flight… HYPERLINK “https://youtu.be/XH_kWzpQ8E0%20…..because” https://youtu.be/XH_kWzpQ8E0 because life is all about learning how to die in some sense…..for salvation……the perpetual freedom……because liberation is conferred to those only who have guts to unshackle & lead a detached life on their own……actually they are redefining life who know what’s freedom……A SIGNIFICANT NOTE IN SUBTLE STROKE…….. I feel good when someone comes with so many questions, options and goes deep in the poem. Thank you so much for your creative support and ideas. Beautifully narrated poetry!! You have such a good hand in English as well Hindi poetry. That’s a rare talent. God Bless. I’m glad you think so. Thank you so much for taking the time to read and share your thoughts here!